Yeah, but: Marshall Mcluhan was right. 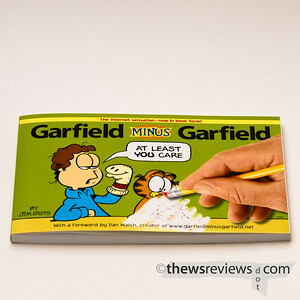 The Long Version: I reviewed the Garfield Minus Garfield website last summer, and was excited when I learned that there would be a book version. I was surprised to find that it wasn't that expensive, and even more surprised to learn that it's in stock at most major bookstores. Once the Christmas crowds had cleared, I ventured back into a bookstore to buy the printed copy. My final surprise was at the difference between the book and the website. It sounds dumb, I know, but I didn't really expect it to be a Garfield book. It's the same size and shape as the books I grew up with. It starts with a five-page introduction by Dan Walsh, the creator of the Garfield Minus website, and is followed by the edited strips in colour, paired with the smaller black & white originals on the same page. Sometimes removing Garfield doesn't change very much. All he adds to many of the strips is a little catty comment that's implicit or otherwise obvious. Other times Garfield was the key to understanding the strip, but that can make his removal even funnier. The strip "You'll never take me alive" (last one in my website review) is completely changed by Garfield's presence: the final frame shows him looking back into the house, not out the open door. I had always 'read' this strip as if Jon had actually been taken. A few of the strips have been more heavily edited. One shows a frustrated Jon tapping his finger, then exclaiming "I can't stand the noise!" The original was "I can't stand the boredom" - making Jon seem much less disturbed. Others have had some of the monologue removed, or the last panel changed to one that shows a quieter moment. There's also one instance where Garfield leaves a visible hole in the rest of the strip. It reminds me of The God of Small Things, where author Arundhati Roy writes "there are no black cats, there are only black-cat-shaped holes in the universe." Perhaps that's exactly the literary allusion that Walsh was looking for; perhaps not. I said before, and I'll repeat it here, that Jim Davis is one of the coolest guys around for not sending copyright lawyers to shut down Garfield Minus. Instead he's the one who has published this book, including a couple of pages of his own thoughts and about 25 of his own de-catted strips. (Well, they're all his strips, but he de-catted these ones himself.) His choices are much more active strips, with the humour more likely to come from a punch-line than pathos. It's an interesting second look, a chance to see the creator's re-interpretation of someone else's creative interpretation. At a poetry reading that would be terrifying, but in a cartoon it's just funny. One of the ideas that I took away from the text in the book is this: when we're kids, we want to be Garfield - lazy, witty, sassy - but when we grow up we realize that we've turned into Jon Arbuckle. Even if that's not true, it's easy to empathize with him, and that's a big part of the humour of the new strip. I'm glad to have found this book, both to support the idea of its creation, and because it really does add some humanity that the website doesn't have.